A journey here is like recapturing a sweetness of life rarely encountered. Nestled up against the Swiss border, the Lake Como area offers a magical combination of lush Mediterranean foliage and snowy alpine peaks. Lake Como has managed to preserve its unspoiled natural beauty, complimented by magnificent villas, exotic formal gardens, multi-colored buildings along quaint cobbled streets. 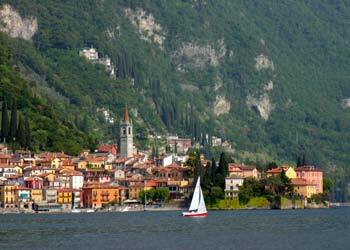 Lake Como is 50 miles long – created by glacial activity- first recorded settlement 59 BC by Julius Caesar. The following painting locations and group dinners are subject to change if I find something more Marvelous and Wonderful! Motor Coach will pick up students at a designated Milan hotel next to the Milan Malpensa International Airport – 12:30 pm. A short, but eventful stop to see Leonardo da Vinci’s masterful fresco of THE LAST SUPPER. Travel to the city of Cernobbio on Lake Como, The Villa Flori Hotel- 4 Star (approximately 1 hour drive). Unpack, rest, afternoon demonstration and painting, dinner, sleep. Villa Flori’s Ristorante Raimondi : For an elegant splurge, we will join Como society where exquisite Italian and Lombard cuisine are served on the lakeside terrace or in the luminous dining room. Cernobbio : The old town features a delightful collection of picturesque houses and narrow alleys. Cernobbio sounds like ‘Chernobyl’ and is 2 miles from Como. Villa Flori : The hotel, an 18th Century villa is immersed in a beautiful age-old park where the Marquis Flori, ancient owner of the villa, grew lemons and oranges. Breakfast daily at Villa Flori. 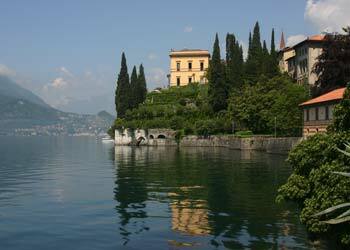 Como : Magnificently located at the southern tip of the lake’s left leg. Como is a lively little city that has long had a bent for science, silk and architecture. Como’s historic centre, its street plan almost unchanged since Roman times, opens up to the lake at Piazza Cavour, with its cafés, hotels, steamer landing and pretty views. Monday, Tuesday and Thursday are open market day. Excellent opportunity to purchase fruit, cheese and bread if you prefer to make your lunch daily. Slow boat ‘batello’ Cernobbio to Varenna - 1 hour 45 minutes –while sitting on deck view villages along the shore back dropped with majestic Italian and Swiss Alps. Hydrofoil – fast boat- 45 minutes. 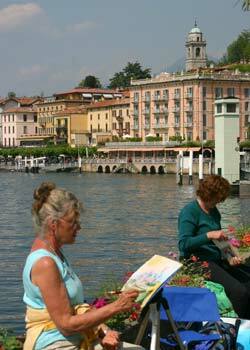 Villa Cipressi : unpack, lunch etc Approximately 2 pm – Demonstration and Painting Grocery store and Laundry nearby. Varenna : The most picturesque town on the lake, its steep winding alleys lined with charming homes, flowering balconies and lace-curtained windows. Two famed villas in Varenna are Villa Cipressi, with terraced gardens cascading right down to the shores and Villa Monastero, a true showcase. However the main attraction here is immersing yourself in the life of the town and with the beauty of the setting. Varenna has less than 1,000 inhabitants. Villa Cipressi : The Hotel Villa Cipressi is a complex of historical buildings built between 1400 and 1800, set along the enchanting lake shore just before the meeting point of lakes Lecco and Como. The Il Passarella – the ever-changing flowery and arbored walk that connects the town center to the lake. Along the walk you’ll pass villas, gardens and boats. The harbor is typical in that you’ll see pastel colored fishermen’s houses and a small beach. Piazza San Giorgio – the main square in town is deep in history and lovely buildings and churches. Bellagio is one of the most beautiful sites in all of Italy, considered by many to be the most beautiful town in Europe. It is as charming as its setting: steep, stepped lanes (carigo/staircases) of handsome old houses and buildings of red, orange and gold, ornate balconies spilling over with flowers and an endlessly fascinating waterfront, where you can linger all day watching the waltz of the ferries gliding to and fro over the mountain-bound lake. Sightsee, sleep in, dine, paint, hike or relax. Isola Comacina : is the only island in Lake Como. You’ll find olive trees, eight ancient churches in ruins, a 15 th century church and more….AND….dining at the La Locanda Dell’Isola – views are wonderful and the meal consists of sumptuous antipasto, trout from the lake, chicken, dessert, cheese and wine…the end of your meal is a liquid delight that the owner concocts with coffee, sugar and brandy which he lights and then chooses a vestal virgin (from the patrons) to have the first taste…all the while recounting in graphic and theatrical detail the history of the island. Villa Balbienello : is arguably the most magical home in all Italy. Featured in the film A Month by theLake, (Vanessa Redgrave) the villa’s loggias, terraces and architecture cascade down the slopes of a promontory. At the sheltered district of Tremezzo the lake opens up to become the ‘mirror of Venus’ , where carpets of azaleas, camellias and rhododendrons, agaves and magnolias bloom under the towering cypresses and palms. 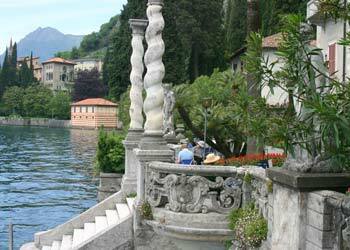 Villa Carlotta : is the most famous villa of Lake Como. It is a beautiful Baroque building dating back to the beginning of the 1700’s, on a hill bordering with the park of the Grand Hotel Tremezzo Palace and its famous botanic garden. Built as a summer home by Marquis Glorgio Clerci. Castello Di Vezio : the castle is located on a hill at the top of the town – wonderful views of Lake Como – gardens, a falconer some days, drawbridge, and small café. The Fiumelatte (River of Milk): a river and town – Leonardo da Vinci was quite perplexed by the river as he and countless others failed to find its source. It runs for only 250 meters and this and the degree of descent give it its white milky appearance. Tour : approximately 1 ½ hour – walking History, art appreciation, information on St Mark’s Square area and interior and exterior of the Doge Palace……..scout out painting location gems. Venice : is one of the few cities in the world that can be truly described as unique. It survives against all the odds, built on a series of low mud banks. It is a magical city of bouncing light and reflection – a city that has altered little- sight and sound. Burano : is the most colorful of the lagoon islands and can be distinguished from a distance by the tilting tower of its church. In this traditional fishing village, fishermen haul in their catch every morning, and women sit in their doorways of the fantastically colored houses, creating unique knots of Venetian lace. The town features traditional lace and linen stalls and open air trattorias serving fresh fish. (Lunch maybe).